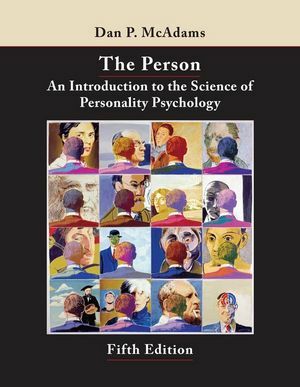 Drawing on cutting-edge scientific research, classic personality theories, and stirring examples from biography and literature, The Person presents a lively and integrative introduction to the science of personality psychology. Author, Dan McAdams, organizes the field according to a broad conceptual perspective that has emerged in personality psychology over the past 10 years. According to this perspective, personality is made up of three levels of psychological individuality - dispositional traits, characteristic adaptations (such as motives and goals), and integrative life stories. Traits, adaptations, and stories comprise the three most recognizable variations on psychological human nature, grounded in the human evolutionary heritage and situated in cultural and historical context. The fifth edition of this beautifully written text expands and updates research on the neuroscience of personality traits and introduces new material on personality disorders, evolution and religion, attachment in adulthood, continuity and change in personality over the life course, and the development of narrative identity. Dan P. McAdams, Wilmette, IL, is Professor of Psychology and Professor of Human Development and Social Policy at Northwestern University. He is the 1989 winner of the Henry A. Murray Award in Psychology for the study of personality and human lives. McAdams is also a Fellow of the American Psychological Association and currently the director of the Foley Center for the Study of Lives at Northwestern, which is funded by a $1.5 million dollar grant from the Foley Family Foundation. The Center is dedicated to the social-scientific study of personality and social development in the adult years, with an emphasis on such prosocial aspects of human functioning as altruism, leadership, and the development of self-understanding in adulthood. The text reflects new findings obtained with respect to the correlates of personality traits, the dynamics of motives and goals in human lives, and the meanings and manifestations of life stories. The person uses stories and biographies to illustrate personality concepts.